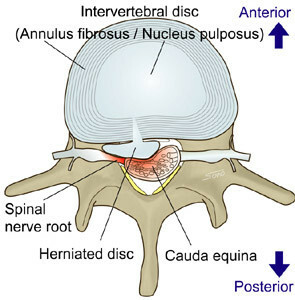 The term lumbar disc herniation is the pathologocal condition caused by prolapse of disc materials with the spinal canal. 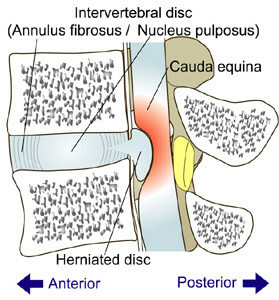 Stenosis is directly caused by compression of disc herniation. As a result, patients experience acute back and/or leg pain. When any form of conservative treatment is ineffective, surgical removal of herniated disc is indicated. Posterior micro removal of herniated disc (so called micro LOVE method) is a less invasive surgical procedure that has been widely recognized and operated to treat lumbar disc herniation. Using operative microscope, herniated disc is extracted through a small incision made in back. However, an even less invasive (minimally invasive) surgery called Percutaneous Endoscopic Lumbar Discectomy (PELD) gives more advantages for some lumbar disc herniation. Incision is extremely small in PELD. A 7 to 8 mm diameter endoscope is usually inserted through skin to reach herniated disc. 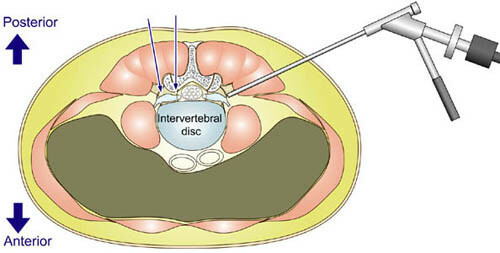 Herniated disc is removed with long and thin special instrument. Surgeons monitor the procedure via image captured by endoscope. Three days and two nights hospital admission should be sufficient due to short and safe operation. Please note that, depending of severity of herniation, PELD is not always applicable.